The Cruiser is beginning to look like its ready for some trips. 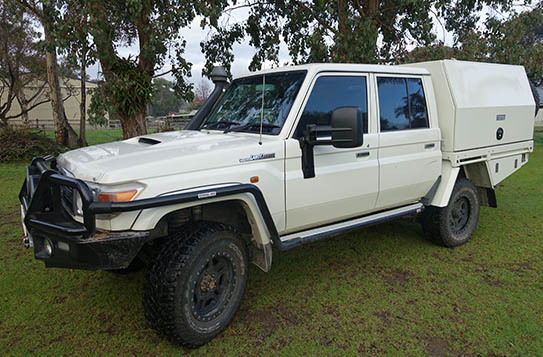 In 2016 we bought a 2013 4.5-litre V8, 70 Series Land Cruiser dual-cab with 105,000km on the clock - with the thought that in a few years the ol' Patrol will be retired - not so sure about that though, so we'll see. It had been a mine exploration vehicle but had seen little real work, even though it had a few options fitted, which were either too heavy duty or not suitable for what we wanted to do, or were just woeful looking. We headed to Outback 4WD in Bayswater (www.outback4wd.com.au), who do all our service work, to get the first lot of our preferred goodies fitted. Bullbar and side rails - the beginning of a touring set-up. First up was a bullbar to protect us from wayward animal strike and we opted for an ARB Summit bullbar, which not only delivers air bag compatibility but also has a 60mm top tube, LED indicators and fog lights. Adding to the protection criteria we added a set of side rails and steps, the OE alloy ones getting the flick for something that will give a lot more protection. I've gotta tell you the build quality and finish on this bar work is exceptional and while some will say that there can't be too much difference between various makes and brands, I'd have to disagree, putting this Summit range on top of the list in strength, styling and finish. 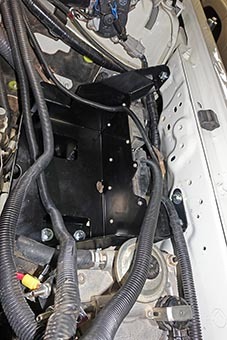 Read more about the ongoing development of our dual-cab Cruiser which sees a new tray and a plastic fuel tank fitted. Read more about our new canopy, a dual battery system and a fridge slide in the never ending quest to build a great touring machine. It's turned into a lesson in weight management. Tucked in behind the bar is a Warn XD9000-S winch with Warn Spydura synthetic rope. I thought long and hard about this as the Warn range of winches don't come cheap but their reputation is as big as the hills they help you climb, so reliability and durability won the day over any savings I could have made. 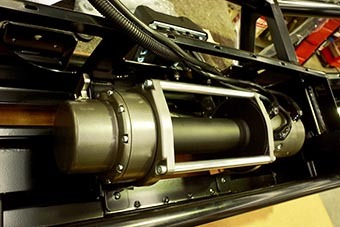 The Warn XD9000-S winch fits snugly into the bullbar. Helping light the way at night is a pair of Lightforce DL230 HTX hybrid driving lights featuring a ring of 20 LEDs and a 70-watt HID light within a 170mm reflector. The LED's provide and instant flood of wide beam light while the HID bulbs produce a bright far-reaching light that punches down the road or track. It combines the best of both worlds in LED and HID technology and are a dream to drive behind. 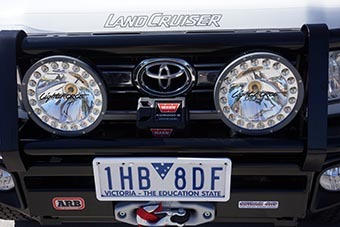 Combine that with the effective and sturdy mounting brackets that Lightforce are so good at and you've got a great light ideal for those long outback drives. If there is any down sides to this light it is their relative size, which means they are too big in many situations; as it was they just managed to tuck in behind the leading edge of the Summit bar. Wanting to tow our camper and/or van we fitted down the back end of the Cruiser a Hayman Reese towbar. Again these are a well engineered and Aussie manufactured product that sit at the very top end of design and build quality for these products. 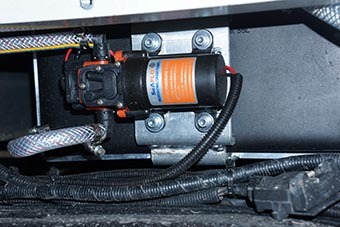 We completed the installation with a 7-pin trailer connection, an Anderson plug to bring 12-volt power to the trailer while a Redarc Tow-Pro trailer brake controller was also wired into the system. We've had one of these on our Patrol for a few years now and I wouldn't have any other electric brake controller, simple as that! 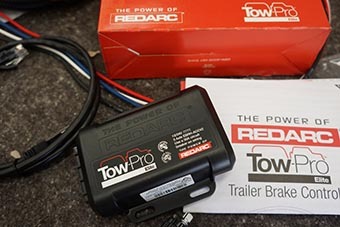 Tow-Pro kit is best brake controller on the market, I reckon. 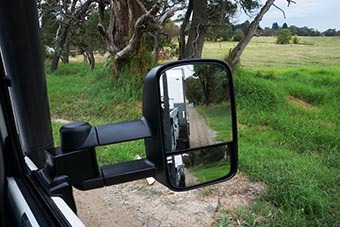 We added a set of Clearview extension mirrors, which I've got to say are the best set of towing mirrors I've ever used. These units have two mirrors in each housing; the top or main mirror (powered in some units) gives a great clear view of the road behind, while the smaller, convex mirror helps eliminate any blind spots. When towing, the mirror housing extends out another 100mm to give a better view down the side of a wide van or whatever you are towing. Yes, they are big and when folded inwards still protrude some way out from the vehicle body so you need to be careful on a tight scrubby track .... but I wouldn't swap them for the originals anytime soon. Clearview mirrors are great for towing. Wanting to improve the rubber on the Cruiser I decided I'd first go to a bigger rim and after a lot of procrastination I settled on a set of 17x8.5 Pro Comp, Series 29 Satin Black alloy rims. These aggressive looking units feature a split 5-spoke design but more than anything I wanted a strong rim and the extra thick outer lip provides added protection and strength for travelling the backroads and tracks of Australia. 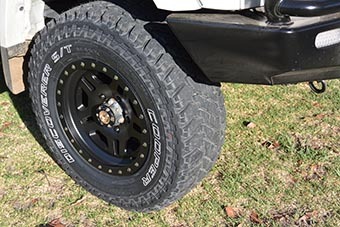 Pro Comp have a huge array of rims to choose from, with this particular style available in 15, 16 and 17-inch sizes with 5, 6 or 8 bolt stud fixtures, while load ratings vary from 1133 to 1587 kg per wheel. Not only do they look good, they do everything I need from a good tyre rim. Pro Comp wheels and Cooper S-T Maxx tyres. Once again I settled on a set of Cooper S/T Maxx tyres and went for a slightly bigger tyre size than standard fitment, stepping up to a 285/70R17 size, with a load/speed rating of 121Q. The '121' means each tyre is designed to carry a maximum load of 1450kg with a maximum speed designated by 'Q' of 160kph. In all, there are 30 different tyres sizes in the S/T Maxx range suitable for 15, 16, 17, 18 and even 20-inch rims so we're a bit spoilt for choice. Why do I like the S/T Maxx so much? They have proven over the last 10 years or so, on our travels around the world (145,000km, 36 months over 4 years), North America (70,000km, 13 months over 4 years) and Australia (who knows ... lots) to be a tough reliable tyre with good handling and wear characteristics. While I've had the occasional puncture and even shredded one a couple of years ago (due to my own stupid fault and not having a tyre monitoring system on board) I can't see any other tyre giving me the same offroad performance and long time wear life that the Cooper's have; I wont be changing brands anytime soon. Boss Aluminium tray and canopy is a work of art. When I fitted the alloy tray and canopy from Boss Aluminium in Bayswater, Victoria, I was not only wanting a good looking, robust canopy and tray but also one at the lightest weight possible. I soon found out how weight adds up. The canopy (my fourth on 4WD vehicles I've owned) fits all my criteria and is a work of bloody art, I reckon, it is so well designed, manufactured and finished off. But I digress. Lets talk weight! The canopy with all its internal shelving, framework and drawer weighs in at 200kg. The two spare wheel holders - without the wheels - weigh 15kg each; the drop down fridge slide, without a fridge, weighs 37kg, so there's another 267kg on the back of the Cruiser, without even blinking or thinking and I've yet to put anything into it. It's amazing how weight adds up! 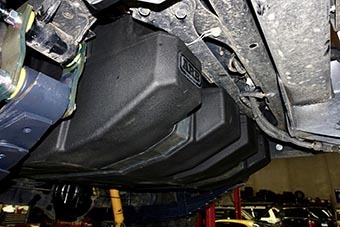 Rear underbody boxes on tray. Watertank and pump are under tray. 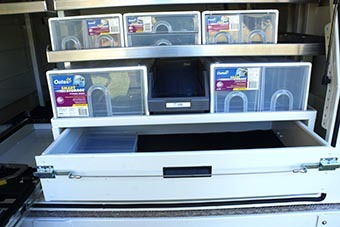 Inside the unit there is some internal shelving, which we've fitted with a range of Oates Smart Storage Drawers from Bunnings. We've used these in the Patrol for 10 years or more and found them to be durable (we've never replaced them!) and they work well and are light weight. Slide-out table, drawer and storage area. There's also a fairly large pull-out drawer and a slide-out table below that, while there's also room for a fridge at the front of the canopy, all on the passenger side of the vehicle. The driver's side is a vast open playing field at present and I'm not even sure what I'll be putting into it. My swag and tool roll will be the start. Under tray drawer with sliding top. The drop down fridge slide we've fitted is the Easy Slide from Clearview Accessories, and was fitted by the crew at Boss. I've had the forerunner to this unit in my Patrol for years and it has been a beauty, so I knew what I wanted right from the start. The Easy Slide lowers the fridge unit 290mm making it a lot easier to get a coldie or some salad from the fridge. Designed in Australia, the unit has been improved since my Patrol's early model, making it easier and safer to use and capable of handling up to a mammoth 180kg load. With its safety locking mechanism and additional travel lock, the unit has been crash tested and is ADR compliant with a 36-month warranty on moving parts. 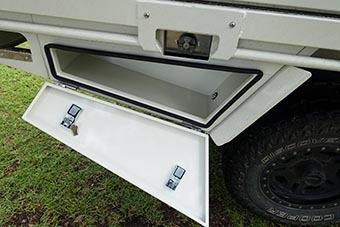 Available in three different sizes to suit just about any portable fridge/freezer on the market, I opted for ES-100Plus Easy Slide, which handles an ARB 47-litre fridge easily. 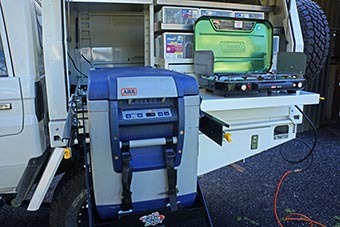 It also fits the Engel 40-litre or the National Luna 55 Weekender. On the outside rear wall and connected into the framework of the canopy are the two spare wheel carriers. These are adjustable so they can carry any size rim and tyre up to 38-inch in diameter; we wont be going that big! 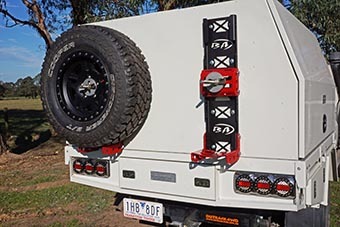 Rear tyre carriers are well designed and can carry a variety of tyre sizes. 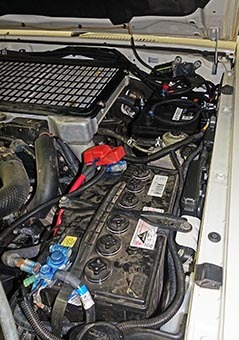 As soon as the canopy was fitted I was back at Outback 4WD where we fitted a dual battery system. 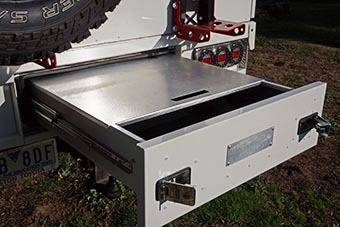 We used an Auxiliary Battery Kit from ARB, the battery box being made from 2mm powder-coated steel and with well designed supporting and holding brackets to ensure the heavy battery doesn't break away from the vehicles body work when on continuous rough roads or tracks. Believe me, I've seen and used lesser quality battery kits that cause nothing but trouble once you are off the bitumen for an extended amount of time! New battery tray is well designed to hold the heavy battery. 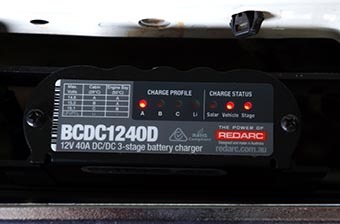 Controlling the charging of the second (or auxiliary) battery I've fitted a Redarc BCDC1240D DC-to-DC battery charger. This is certainly not the cheapest option you can choose (I have a Redarc Smart Start SBI unit in my Patrol, which has worked just fine), but the DC to DC charger was considered the best option, so I went for it. Not only does this unit act as an isolator for the main battery it will ensure your second battery is fully charged at all times, whether it takes power from the alternator or from any solar panels you may have connected. Redarc battery charger and isolator does a great job at keeping both batteries charged to their proper levels. Installed 180-litre fuel tank fits snugly with cutaway to keep departure angle better than previous. 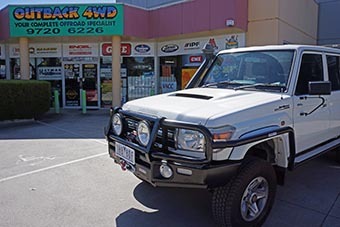 Wanting to increase the fuel range of the Cruiser I've opted for a replacement 180-litre ARB Frontier tank fitted by the crew at Outback 4WD in Bayswater. These tanks from ARB are made from a resilient cross-linked polymer and UV stable plastic material and have a wall thickness of 7-9mm, which is much thicker than any of the OE plastic tanks I've seen. They have proven to be strong and rigid having been tested by driving a 60-tonne Centurion tank over them! They are also significantly lighter than a steel tank and depending on the model of tank for a 79 Series, weigh up to 22kg empty. The tank comes with all the fitting hardware required as well as a fully machined filler neck made from aluminium, while the tank breather pipe is fitted with a one-way valve to stop any spillage in case of a rollover. 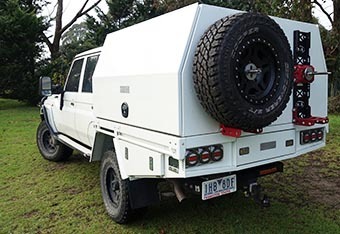 We've got a few more things to fit before our first real bush trip up into the High Country of Victoria and by then we'll have a capable and comfortable rig that can handle anything the country can throw at us.